One of the most important things to college freshmen, if not the most important, is that the college they have chosen to attend will ultimately help them find a job. In a 2015 study by The Higher Education Research Institute at UCLA, 60.1% of incoming freshmen indicated it as “very important” that their college’s alumni get good jobs after graduation, up from 2013’s 53.1%. While this percentage has never been exactly low, it has slowly risen since the mid-1980s, showing that more and more the idea of finding a job after graduating from college is becoming less of a given. Not all schools are equal in this, and some colleges are vastly more supportive of their students’ post-graduation concerns than others. 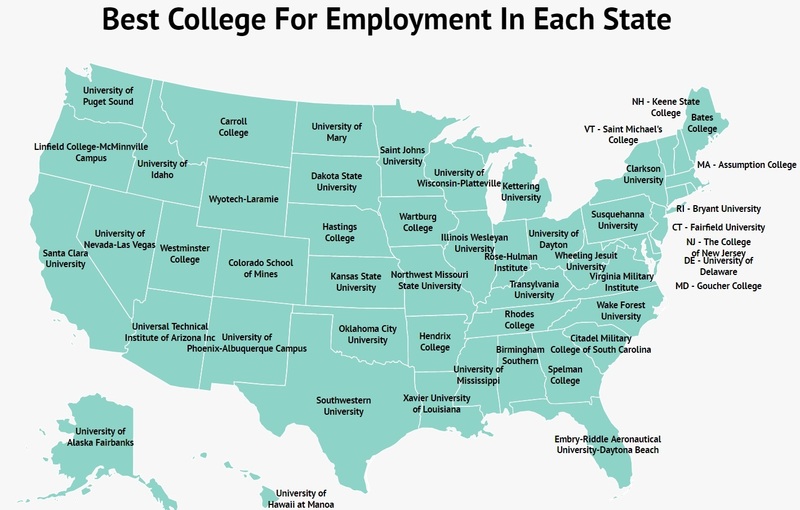 To help showcase some of these stand-out universities, in addition to the map at the top of this article, we at Zippia have put together a list of the top schools by state in terms of college placement ratings. Both the map and list were created using information found on the Integrated Postsecondary Education Data System (IPEDS) database or the CollegeScoreCard data. 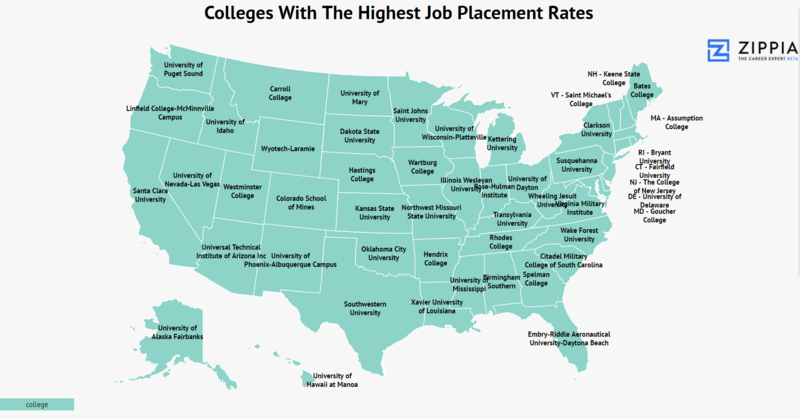 Using IPEDS, we searched for the college in each state with the highest listed job placement ratings, looking specifically at employment levels at year 10 after students have graduated. Then, we looked at the ratings themselves and ranked each state’s top school according to their rating. For the purposes of readability, each school’s rating was then rounded down to the last three decimal places, and we included the city each state’s top college was located in. If you’re looking for a job out of college, you can browse jobs by your college major or learn about what it takes to get a job. Ok, that’s it! Now, onto the list. VMI’s rigorous academics and high standards certainly have something to do with employers’ likelihood of hiring graduates from here, but I’m sure all the cannons and military training don’t hurt either. “Hey Steve, what name were we thinking for this town over here? Yeah, the one with the college in it. Does ‘Schooltown’ work? No? How about ‘The Education Location’? Too long, huh. Hang on, I just thought of a pretty good one.” — Frank Minnesota, state founder, moments prior to naming the town of Collegeville, MN. 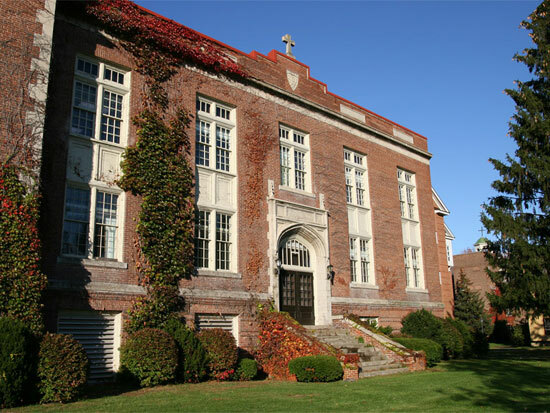 A Roman Catholic school in Massachusetts. 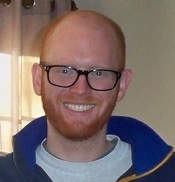 Alumni include Carolina Panthers player Scott Simonson as well as Andy Hallet, an actor known for playing the karaoke demon Lorne on the TV series Angel. Hastings is a self-proclaimed “best buy” school, based on the fact that they’ve been named by Barron’s and Washington Post as being among the most affordable colleges in America. Not to be confused with the retail store “Best Buy,” which unlike Hastings is in no way an affordable place to spend your time. Located just outside of Burlington, VT, a city which has no business looking as gorgeous as a cursory Google Image Search makes it out to be. It is very close to Canada, however, which may or may not be a selling point for you depending on your feelings vis-à-vis America’s Hat. Rhodes College is especially well-known for its mock trial program, which is one of the most prestigious in the country. The fact that there’s no joke in this caption versus the others on this list is in no way related to how many Rhodes College grads go on to become lawyers. The only private Catholic school in North Dakota, as well as the only College of Distinction in the state. The school sports teams are referred to as the Mary Marauders, which sounds to me like a roving band of vikings who are all named Mary. Susquehanna was rated 54th best liberal arts college by Washington Monthly, and 1st most likely college to be slightly mispronounced by me the first time I have to say it out loud. The most important thing to know about this school is that someone named Charles “Buffalo” Jones A) existed in the real world, and B) attended this school for two years during the 1860s. He was an accomplished conservationist and went on to found the city of Garden City, but again, the important thing is that his name was Buffalo Freaking Jones. No college can guarantee you a job, but regardless, many still stake entire reputations on their alumni’s employment rates. Because of the importance of applications and placement rates to incoming freshmen getting into school, it can often be tough to tell who to trust with these numbers. While some institutions go to great length to ensure their numbers are as accurate as possible, not all are as diligent — or (let’s just say it) as honest. As this Hechinger Report article by Jon Marcus details, many universities are either misleading or outright lying about their placement rates, and there’s not always a ton of oversight when it comes to ensuring the rates they report to prospective students reflect the reality. Simply put, some schools are fudging their numbers. And certain organizations who used to audit this information, like the Graduate Management Admissions Council, are now taking job placement information directly from the schools themselves, breaking down some of the transparency that once existed in the system. Fortunately, there are still plenty of groups around who remain the impartial watchdogs they were intended to be (for now, at any rate). One of these is the IES, or the Institute of Education Sciences, a bipartisan government organization dedicated to finding scientific data related to education. They try to keep this information as impartial as possible so that it can be used across the aisle as a solid base on which to build effective educational policies, and they keep this information in the IPEDS database mentioned at the beginning of the article.